This is one of my favorite shots from the Greenway Tech Centre project – a conversion of a former cigar factory into high-tech, loft-style offices. So what are you looking at? A modern addition was constructed to house lobbies and vertical transportation. 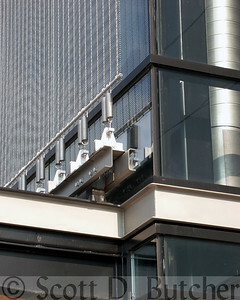 Because the building is “green”, this feature helps reduce energy costs. It is a metal fabric sunscreen, which reflects much of the light entering through the glass and ultimately cuts cooling costs: less light = less heat = less energy.